with unique programs & handy services. 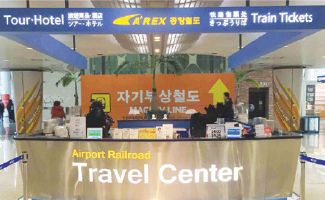 Since 2011, Korea's Ministry of Culture, Sports, and Tourism (MCST) and the Korea Tourism Organization (KTO) have been identifiying, evaluating, and supporting new innovative and creative startups in the tourism industry. Tourism venture companies offer new services and special activities to MICE participants! Business and Travel made comfortably easy! i-Trip's services are geared towards offering convenience to travellers, especially to business travellers with hectic schedule. i-Trip's main services include airport-to-hotel baggage delivery service and airport pick-up or transport service. 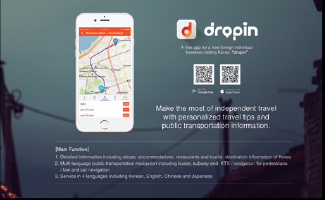 SNBSOFT's Dropin, is Korea's only multilingual map and public transportation app. This app lets you check nearby accommodations, shops, restaurants, attractions, and other hot spots. It also helps you select the most convenient route or mode of transport to reach your destination. RED TABLE offers MICE visitors an app and a Foodie Pass. 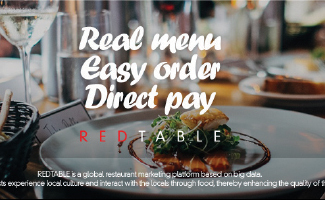 Red Table's app lets you order food from restaurants highly recommended by locals and pay directly without language problems. The Foodie Pass is offered as products for incentive/business tours. Through the pass, visitors can easily reserve an outstanding local restaurant in Korea at 10 to 50% discounted prices. Experience Campus Life in Korea! Campus Stay enables MICE visitors to reserve and use school facilities such as dorms & convention halls of over 395 partner universities. 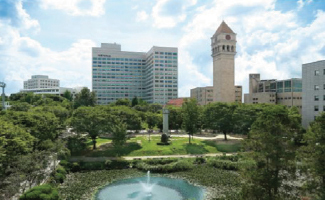 They also provide tour programs, concierge, and catering services. Get the adventure you're looking for! Teamax Adventure specializes in team-building and unique outdoor activities like biking, kayaking, camping, and backcountry skiing tours. 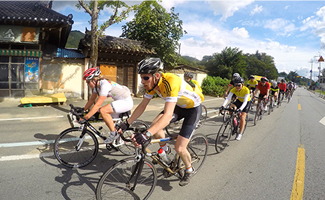 Among their popular group programs are Running Man in Seoul and Seoul to Busan 600km Bike Tour. 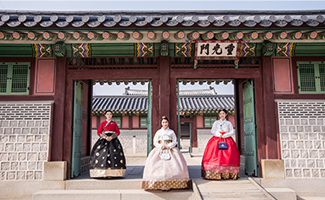 Hanboknam is a Korean Traditional cultural space most popular for its renting services of Hanbok, Korean Traditional Costume. They also organize special parties, mini festivals, flash mobs, and traditional experience programs.